One of the most intentional and important choices I make as an artist is the colour palette choice for a painting. The choice of colour impacts the emotion a viewer feels. It can enhance or detract from a work of art. The very essence of colour unto itself is a tool for communication. What is it about this simple concept that makes it quite complex in actuality? Research has shown that the use of colour can directly impact our mood. Think about the choices we make in our daily lives with regards to colour. The choice of clothing combinations – what does it say about one’s personality, the statement they are trying to make or how one is feeling on a given day? What about other colour choices? Consider the last time you decided to paint a room in your house? Why did you choose the colour that you did? Think about how the colour of food affects one’s appetite and how it can add to the appeal of trying a new dish. As an artist I strategically consider how the colours will support both the title of the work and the imagery in the piece. My series on mental health, “Walk a Mile in my Head” combines blacks, greys and blues for every painting. Often we associate the shades (blacks), tones (greys) and colours such as blue as being sombre – a way to depict sadness and loneliness. I chose these colours for this series, not because people impacted by mental illness always feel this way – they don’t. Rather I chose these colours to elicit a strong emotional connection for those viewing the pieces. The incredible thing about colour is that it can have multiple purposes. In a recently completed painting of John Lennon “Saying I’m a Dreamer, but I’m not the Only One” I use the colour blue to create a sense of calmness. When combined with other colours in the piece, most notably yellow (warmth and optimism) and pink (love) I am trying to create a mood, a message of hope and positivity. The beauty of colour choice is that on the canvas there is no right or wrong. Some combinations may be more pleasing, some may seem to be more balanced, but all colour choices have a purpose. The wonderful thing is that there are as many perspectives and interpretations of a painting as there are colour combinations. Whether the colour choices are pleasing I leave up to you; however, next time you view a work of art consider how the colours are impacting your feelings about the piece. Al Gord is an up and coming artist who has been a featured artist twice in Niji Magazine. He has sold paintings in shows from Toronto, Canada to the United Kingdom. 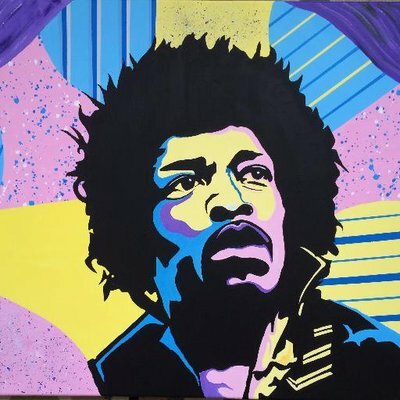 He combines abstract techniques with figurativism to create Iconic Rock Portraitures. Other series of works include Modern Romantic (Uninhibited), Expressionist pieces and pieces which focus on mental health awareness and advocacy. Regardless of the subject matter, his signature style is clearly recognizable. His work is showcased on Twitter, Instagram and Facebook, where he welcomes inquiries, questions, and feedback. Al Gord and Al Gord Art: All work is the creative and intellectual property of Al Gord and Al Gord Art. No part of my work (specific work, its electronic reproductions or its intellectual property) may be reproduced, copied, modified, transmitted, re-distributed or adapted, without the prior written consent of the artist, Al Gord. This entry was posted in Artists on a Limb and tagged Al Gord, art and emotions, Artist, colour and art, emotions and colour, John Lennon, Saying I'm a Dreamer painting, the power of colour, Writing Art by Lora. Bookmark the permalink.